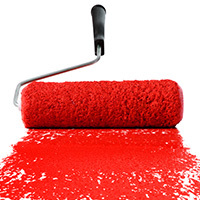 Loveland Painting Contractors | Distinct Painting, Co.
With plenty of painting contractors in Northern Colorado, how do you settle on just one? At Distinct Painting Company, our beginnings started right here in Loveland over 10 years ago, and we are fond of the Northern Colorado region enough to set roots and grow our painting services. 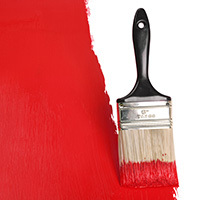 We know our potential clients are combing the internet and doing research to find the best painting companies in town — the results may be overwhelming, but the decision is easy. Distinct Painting Company is the only logical choice in house painters in Loveland, and we quickly discern ourselves from painting industry, so follow along to learn how. Doing an online search yields a result of over 10 painting companies just on page one, and who wants to sift through and compare them? Who has the time? We’ll save you time and bear the best painting services with our transparent business practices. At Distinct Painting, we’ll be up front and honest about your services. Often times you’ll find a company who provide good services but end up charging you for add ons at the end racking up the bill, or a company who does the bear minimum or shoddy work. We always give you an up-front and honest estimate of what the project will cost, and if we think you need anything additional, we communicate with you first before any charges are added. We are big proponents of communication. If you’ve ever had any kind of work done on your home, you want to be included in the conversation, yet a lot of the companies don’t do this. We are partners in this process, so we’ll always inform you on our progress or if anything comes up — this way you don’t have to stress about anything or feel left in the dark. Our painting services are comprehensive. Not only do we provide interior and exterior house painting, we do restoration and wood staining work. Interior – If you’re ready to transform your interior space with color, Distinct Painting Company does just that. Work with us from beginning to end — from picking the right color to a professionally painted interior that evokes feeling and artistry. Exterior – If your curb appeal is a bit lackluster, give it an instant facelift with exterior paint. With the right color you can highlight your home’s good features and mask the flaws. Restoration – Customize your new home build or renovation with our restoration services. Once the house can be painted, we’ll go in and give it the paint colors we’ve discussed beforehand or finish any specialized woodwork and staining — all before you move in, so it’s ready to go! Staining/Finishes – A professional staining to doors and windows can extend the life of your house and give it an update with minimal work. Our Story – We’ve been in the home improvement industry for over 10 years, so our skills and experience allow us to continue our craftsmanship on homes across Northern Colorado. 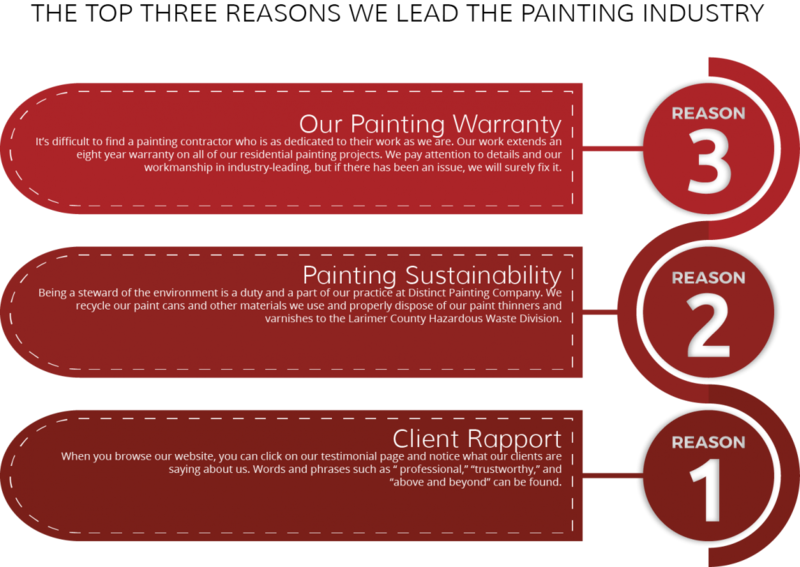 We’re invested in our clients and stand behind all of our work a painting warranty that extends over an eight period. To work painting contractors who have your best in mind and always perform exceptional work, connect with us today!